I'm a huge fan of slow cooker Keto recipes. There's nothing worse than taking two hours to make dinner and by the time it's done you don't even want it anymore. For this easy carnitas recipe, I threw all the ingredients in my slow cooker turned it on low, 8 hours later it was done and the meat was cooked perfectly! I would have loved to have my Keto carnitas on a tortilla, but to be honest, the flavors in this recipes made me forget all about the tortilla. I made these into Keto Pork Carnita lettuce wraps y using a head of bib lettuce, and topped them off with some cilantro, red onions and sour cream! The Bibb lettuce will work much better for lettuce wraps than a regular head of lettuce! 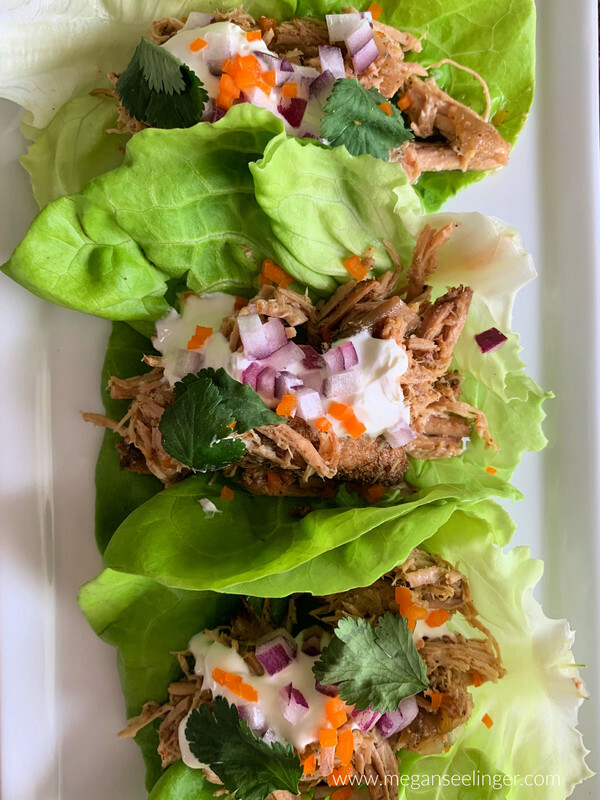 Bibb lettuce will make small lettuce wraps, so I recommend putting about 1 ounce of Keto Carnita Pork onto each piece of Bibb Lettuce. I typically enjoy 3-4 Keto Carnita Lettuce wraps for a meal. In a small bowl you’ll combine chili powder, ground cumin, dried oregano, salt, and pepper and use that seasoning to cover the pork on all sides. Then place the seasoned pork in your lined slow cooker. Once all the ingredients have been added cover your crockpot and cook on LOW for 8 hours or high for 4-5 hours. I prefer cooking the Keto carnitas on low so the pork is tender. Use two forks to shred the pork. 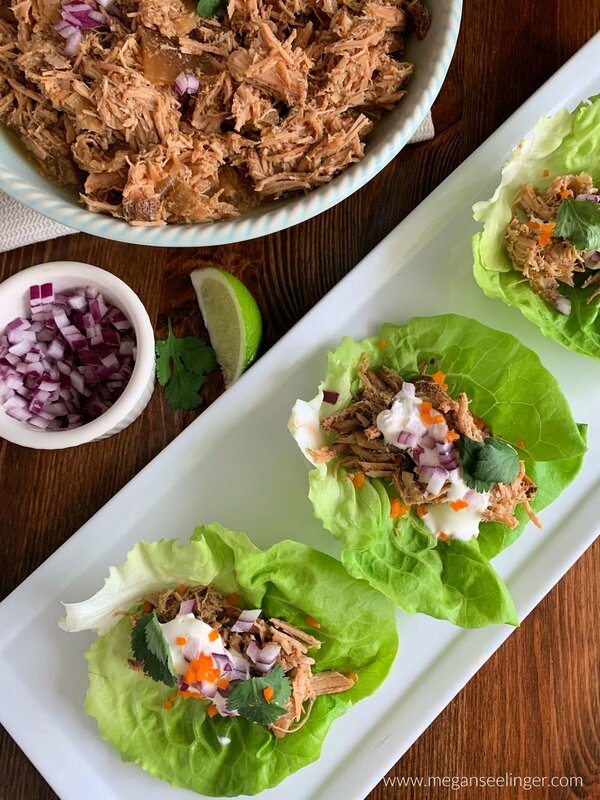 No need to take the pork out of the slow cooker just portion out 1 ounce of Keto Carnitas and serve on Bibb lettuce, garnished with cilantro, chopped red onion and sour cream. In a small bowl, combine chili powder, ground cumin, dried oregano, salt, and pepper. Season the pork on all sides and place the seasoned pork in your lined slow cooker. Add the garlic, chopped onions, orange juice, and lime juice. Cover and cook on LOW for 8 hours or high for 4-5 hours. Use two forks to shred the meat. No need to take the pork out of the slow cooker for this step. Nutrition Facts are based on 1 oz of Carnita on one piece of bib lettuce. Sour Cream and additional toppings not included. Bib lettuce is usually small so I typically have 3-4 Carnita lettuce wraps as a meal.